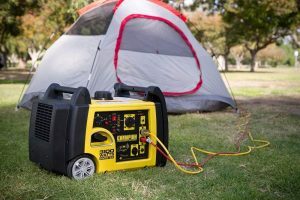 Although it’s described by the manufacturer as offering a great combination of convenience and versatility, another element is what makes this device stand apart from other similar generators in its line and this is its ultra-quiet operation capability. What this means for you as a user is that you’ll be able to place it around your yard or use it on your next project without any troubles in terms of noise. Moreover, the 58dBA operating sound means you can also use it as backup power for your home and keep it running nearby. Since it features 3100 starting watts and 2800 running watts, this model will prove to be a reliable partner, especially since it can run for up to 8 hours at a 25% load. If you plan on using this device on a certain radio frequency, then it’s good to know that some users have experienced certain issues when it comes to this topic. The device tends to experience some radio frequency interference, so it might be hard to get to communicate with a radio from HF bands up to VHF ones. You might need to find some additional solutions in order to shield the device from this interference. In case you have any additional questions on this topic, you can always contact the manufacturer for further information. One of the characteristics that make this a highly convenient model that takes into account the operator’s comfort is the fact that you can start and stop it from up to 80 feet away. This is all thanks to the wireless remote key fob delivered with the unit. Moreover, this electric start also includes a battery. As this would not be cool enough, the model also includes the manufacturer’s Cold Start Technology which ensures a quick and effective start even in cold weather. Plus, given that all of the controls are available in the Quick Touch Panel, you don’t have too much to worry about in terms of easily operating the device. Because keeping everything safe is one of the main aspects you should take into account when operating a generator, the fact that this model’s construction includes a low oil shut-off sensor is certainly a very good thing. Since this inverter produces only Clean Power (less than 3% THD), you can connect your sensitive electronics with confidence. Furthermore, also a matter of operating the device in the safest and most convenient way possible, this generator includes a smart Economy Mode which reduces the electrical load. What this means is that the operating noise is kept lower, while the engine’s life is extended and the fuel is better used. 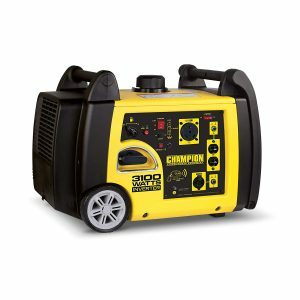 As this type of device needs to be able to support many different types of outlets in order to be as useful as possible, you’ll be happy to know that Champion’s generator is no exception to this approach. The unit includes a 120V 30A RV (TT-30R), a 12V DC automotive-style outlet with a dual USB adapter, two 120V 20A household outlets (5-20R), as well as 12-volt DC battery-charging cables.